The IHE-Europe Connectathon 2017 was held at the Maritime Port in Venice, Italy from 3-7 April 2017. With around 1000 attendees at the Connectathon and the many parallel events, the Connectathon 2017 surpassed even the highest of guesstimates. eHDSI – The European eHealth Digital Service Infrastructure for cross-border health data exchange – participants were Portugal, Austria, Croatia, Switzerland, Czech Republic, Belgium and the European Commission. 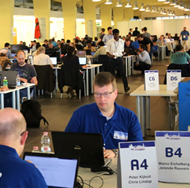 EFA – The German Elecktronische FallAkte, which connects hospitals, chose to perform its second Projectathon in Venice and expanded its testing with deployment test cases including IHE Profiles including XDS, ATNA and XUA. mHealth Plug-a-thon afforded the Mobile Health Community an educational programme followed by the opportunity to innovate in connecting to the APIs of health IT product solutions over a two-day session. Each day, in parallel to the Connectathon, there were specialist events including both international and national symposia, associated meetings, discussions and workshops. Additionally, VIP groups got the chance to visit the Connectathon floor. IHE-Italy is a not-for-profit organisation that has been promoting IHE in Italy since 2001. IHE-Italy is sponsored by SIRM, the Italian Radiologists Association. IHE-Italy supports both the vendors and users communities in their usage and implementation of IHE Profiles and as such it has hosted and organised several Connectathons over the years (2004 in Padua, 2011 in Pisa and now 2017 in Venice). IHE-Italy is a member of IHE-Europe and IHE International and IHE-Italy’s leadership is prominently involved in many IHE initiatives at international level. Arsenàl.IT is a voluntary consortium comprising 9 Local Health Authorities and 2 Hospital Trusts of the Veneto Region and IOV. It is Veneto's Research Centre for eHealth and aiming to enhance the quality of the clinical processes and assistance offered to its regional citizens. The young and skilful team is focused on interoperability issues, studying them at the international level and applying them at a local level. Arsenàl.IT provides guidelines on interoperability for healthcare information systems at regional levels based on its long-time collaboration with IHE International and IHE-Europe. Regione del Veneto is a regional authority located in the north-east of Italy with a population of about 4,950,000 inhabitants organised in 7 provinces with land that widens from the Venetian seaside to the mountain-top settings in the Dolomites area. The region is one of the most industrialised both at national and European level. The regional healthcare system is based on a public system with 9 Local Health Authorities and 2 main Hospital Trusts.